Are you interested in learning sign language? Why not make a start with this introductory vocabulary of signs - aimed at learners wishing to communicate with Deaf people and also with children and adults with Special Educational Needs (SEN). 52 signs for family members and related terms. Signs for: adopt, adult/grown up, aunt/auntie, baby/infant, boy, brother, child, children, cousin, dad/daddy, father, daughter, divorced, family, girl, grandad/grandfather, granddaughter, grandma/grandmother, grandson, great grandfather, great grandmother, grow up, husband, look after/care for, man/male, married, mother/mum/mummy, nephew, niece, old, parent/s, partner/mate/buddy, sister, son, spouse, stepfather, stepmother, uncle, wife, woman/lady/female, young. The illustrated colour sign Flashcards are in textbook fixed format with written descriptions and work beautifully on smart phone and tablet, Mac and PCs using the free Kindle reader apps - one sign per page - clear and simple – easy to carry and refer to on the go, for learners of all ages and abilities. Learners have access to built-in functions such as highlighting, notebook, dictionary look-up and more. You can make notes, use multicolour highlighting - highlight a word on the screen to pull up windows for a dictionary, Wikipedia, and even translation. 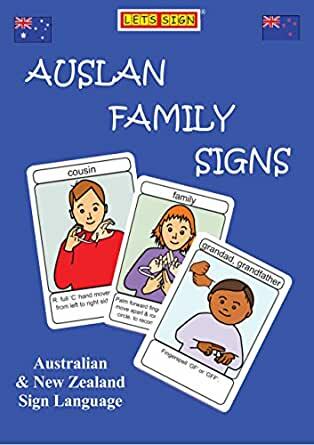 Australian Sign Language (Auslan) and New Zealand Sign Language (NZSL) have evolved from forms of British Sign Language (BSL) and together the three languages comprise the BANZSL language family. They share many of the same vocabulary items and structural features in addition to the use of the same two-handed fingerspelling alphabet. community and also increasingly in the field of Special Educational Needs (SEN) and Baby Signing, where signs are used with spoken language to support communication and language development – known as Sign Supported English (SSE). Due to requests, this resource has been created to include signs specifically for Australian and New Zealand learners and we welcome your feedback in planning any future materials.